The California-based portable battery company is working with everyone from Opening Ceremony to Supreme. Here’s how those hot collabs came to be. The intersection between fashion and technology is still in beta. Google Glass never took off as much as people thought it would, most activity trackers still look super nerdy, and the Apple Watch isn’t selling as well as the company initially hoped. But it’s getting better. Apple recently unveiled a collaborative Apple Watch with Hérmes that combines luxury leather with a custom digital face, and Levi’s is reportedly working with Google on Project Jacquard, a “smart denim” fabric. As technology becomes more and more part of people’s lifestyle, California-based tech company mophie has carved out a unique lane as the go-to company for on-the-go chargers. Started as mStation in 2006 by Daniel Huang and Shawn Dougherty, the company initially made speakers for MP3 players out of a 3,000-square-foot barn near Dougherty’s family home in Kalamazoo, Mich. From an initial investment of $250,000, the company did $1 million in sales during its first year, attracted the attention of Knicks player Carmelo Anthony—who dropped half a mil into the brand, and acquired mophie, then a line of modular iPod accessories, in 2007. Seeing a gap in the market, mophie made its foray into the portable battery business the next year, releasing its first juice pack. By 2013, mophie had a revenue of $215.4 million, and remains the No. 1 seller of mobile battery cases in North America. In 2011, mophie began collaborating with (PRODUCT)RED, an organization that benefits The Global Fund to help eliminate AIDS. It was the brand’s first collaboration, and the next one was much more surprising. mophie announced its Crystal collection in Jan. 2014, partnering with Swarovski Elements to give its juice pack air a high fashion makeover. It marked a shift in mophie’s strategy, one that recognized the growing importance smartphones play in the lives of the fashion set. Ross Howe, mophie’s Vice President of Marketing, has been with the company since it was founded in 2006. He’s played a big part in mophie’s collaborations, and thinks the clean lines on the juice pack are as simple and elegant as any other stylish item. 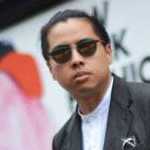 Its utilitarian purpose is self-evident, which he says makes it a platform for self-expression. Five months after the release of the Swarovski collaboration, mophie partnered with Italian fashion house Valentino on a limited-edition version of its powerstation 4000. Only 500 were made, and proceeds from sales benefitted the Cash & Rocket Tour 2014, which brought aid to women and children around the world via three organizations: OrphanAid Africa, Sumbandila, and Shine on Sierra Leone. Indeed, the Valentino mophie comes in a sleek black case that contrasts well with the accessory’s unique shade of “Valentino red.” Howe says there’s an element of mutual trust in terms of what the collaborative products will look like, but also says that mophie has an internal creative agency that works in tandem with industrial designers and the collaborator’s design teams on coming up with how the collabs should be executed. The Valentino mophie collaboration retailed for 250 Euros, roughly $280. Considering the powerstation 4000 costs around $80, it’s quite a markup. Malinowski says the higher price point is justified. In Nov. 2014, mophie unveiled a wearable collaboration with Opening Ceremony. In addition to OC-branded juice packs, the international retailer and fashion brand also created a small run of 100 varsity jackets with gold leather sleeves and gold trim. The snap buttons are adorned with the mophie logo, and there’s a special pocket inside that houses a mophie powerstation. It didn’t hurt that the super-limited piece was spotted on the backs of Rihanna, Beyoncé, Fabolous, and Chris Brown. Even at the steep price of $465, the jackets sold out when they were released. There are currently no plans to revisit any previous collaborations, but Howe says the OC jacket was more popular than they thought it would be, and it would make sense to revisit something similar in the future. When Supreme offered a preview of its Spring/Summer 2015 collection last February, it included a Supreme/mophie power reserve, a compact portable battery keychain. It retailed for $58, roughly $8 over the non-collaborative version on mophie’s site. While that one does come in red, Supreme’s version differs in shade. Malinowski says mophie worked closely with the brand to nail its iconic hue. He also says the final prices are ultimately decided by the brands, and the limited nature of these collaborations justifies a slight retail markup. In true Supreme fashion, the power reserve sold out instantly when it released, and popped up on the resale market. Prices range from $90 on Grailed to $200 on eBay. Howe insists mophie’s recent string of fashionable collaborations is more about the partnerships feeling right and the products aligning with the values of the brands they work with. 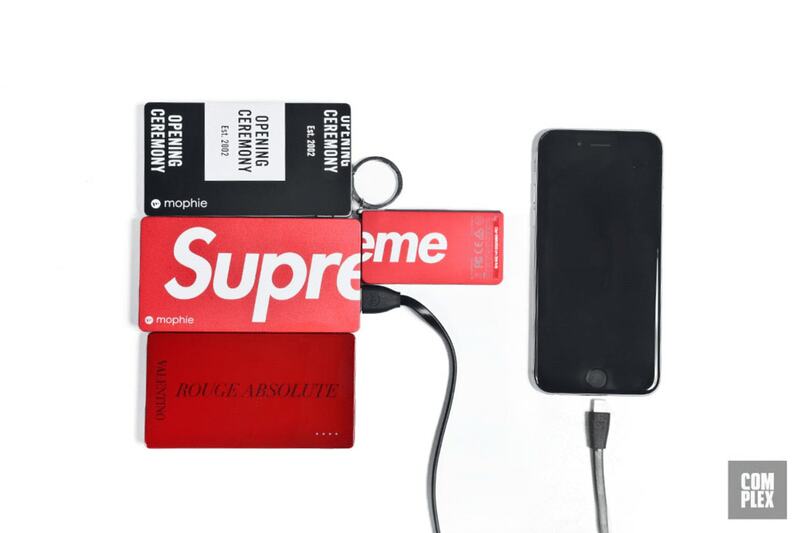 Supreme and mophie followed up with another collaboration for the brand’s Fall/Winter 2015 collection, using one of mophie’s newer products, the space station, a charger that represents mophie’s move towards adding even more utility to its wares. In addition to recharging smartphones, the space station also includes extra storage space for large data files like movies that people may not have room for on their devices. The Supreme/mophie space station retails for $238, and is still available on Supreme’s site. It’s only $38 more expensive than mophie’s unbranded version with the same 64GB capacity. While the price is steeper than the previous collaboration, Howe sees the extra storage space as an added value. The accessory is now a lot more than just a portable battery, and the price reflects that. As devices become more personal and integrated into everyday life—especially fashionable ones, tech consumers and fashion consumers are beginning to meet in the middle and realize how much they have in common. Of course, there’s the issue of obsolescence in technology. The moment Apple changes its Lightning adapter to yet another kind of plug, plenty of mophie’s accessories are rendered moot. Malinowski sees the silver lining in this. The company’s collaborative products could get a couple years’ of use before becoming obsolete, but thanks to their limited nature and brand alignment, they also have a collectible aspect that keeps them desirable.